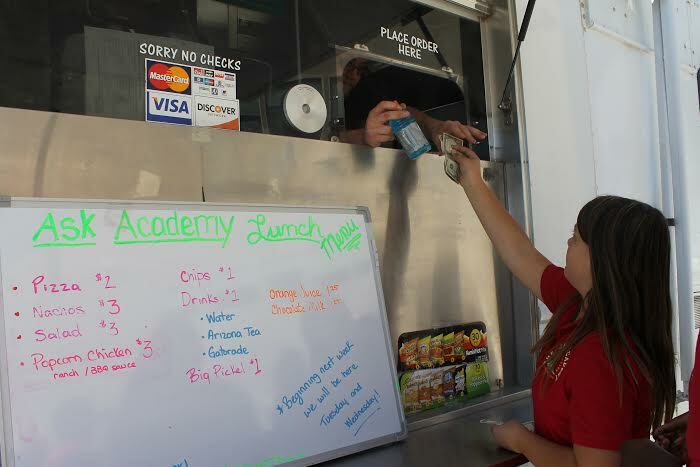 White serves lunch items to scholars out of The Manic Munchies food truck parked on campus Tuesdays and Wednesdays. In another attempt to provide hot lunches for scholars on campus, the administration has attempted a different route this year. Every Tuesday and Wednesday a food truck will be parked on campus during the lunch hour, serving hot food such as pizza, pretzels, and popcorn chicken to scholars. On Thursdays, scholars will end their week with pizza from Aldo’s. In previous years, ASK has attempted to provide hot lunches for scholars, but it’s been unsuccessful. And last year, another catering company, AKayTahRing, was brought on to sell food to scholars. “They came out here for three weeks last year, then they decided it was too far for them to come from the South Valley,” Barbour said. The first week of selling pizza was a success. Employees from Aldo’s set up shop in the Commons, and sold out in 40 minutes. One slice of pizza is $2. There are various types of pies for scholars to choose from, and each week the options change. The second week they brought 13 pizzas, said Aldo’s employee Amanda Wickstrom, and they had more than enough, with some extra pies by the end of the lunch period. However, most of the sophomore class was out that day on a World History field trip. The food truck, which is parked outside on Tuesdays and Wednesdays, has a variety of items on its menu. 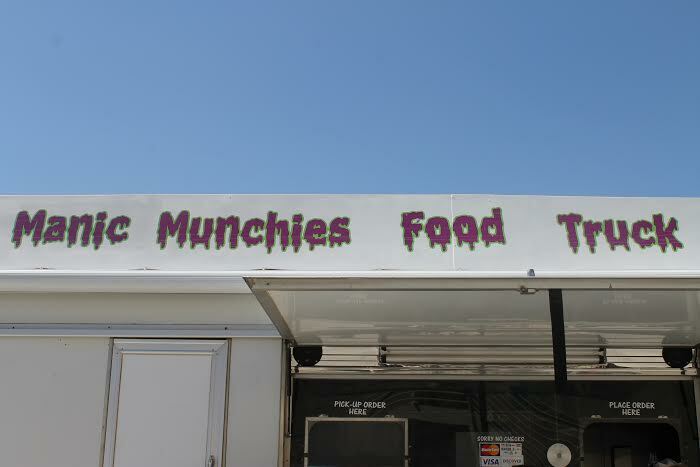 “I rotate my menu every week,” said Mike White, the owner and creator of The Manic Munchies. “The price ranges anywhere from $2 up to $10.” He has yet to introduce the $10 item to scholars. “I hope to do this for two years, and then open a restaurant,” White said of his local business. “I do not do it for any other schools yet, I do it for a few businesses, but you guys are my first school I am helping out,” he said. The ASK Academy is not charging Manic Munchies or Aldo’s to be on campus. However, the goal is to get some of the profit back to the school. “What we ask for with all of our vending machines, is a 10 percent income stream back into the foundation. So not only 10 percent of the pizza, 10 percent of the food truck, but 10 percent of those vending machines downstairs . So they go back into programs for you guys,” Barbour said. Three out of four days are now covered with pizza and the food truck. Barbour said he is working on bringing an option for Mondays. He is working to bring Chick-fil-A or a New York style hot dog vendor on that day. He said what’s important is variety and affordability. Narrator: And now it’s time for Silly Songs with Larry, the part of the show where Larry comes out and sings a silly song. Larry (spoken): Got the munchies on that fateful night, round eight ‘o clock. So I phoned in a pizza for delivery. But I had a feeling that something wasn’t right, ’cause I waited for hours and…no pizza. How would I know that it’d be late? It’s taken so long, where could it be? You’re my number one pie from Sicily! Should I have ordered on the internet? Pizza Angels: Come to me! Pizza Angels: On my knees! Larry: And don’t forget to add my favorite anchovies! When I heard the door! Larry (spoken): I opened the door in expectation, but it was the saddest sight I ever saw. I could still smell the sweet aroma of deep dish goodness…but the box was empty. Pizza Delivery Man Jimmy (spoken): The house number was broken, so I couldn’t find you. I was getting kind of hungry so I…ate your pizza. Sorry about that. You don’t need to tip me or anything. Larry: You’ll live forever in my memory! Larry: I will miss you for eternity! Larry (spoken): I’ll never forget you, Pizza Angel.